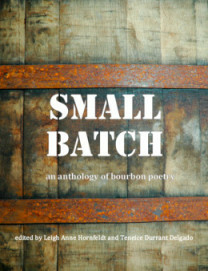 The poems in the anthology Small Batch approach an interesting motif: bourbon. The concept sounds simple, but the variety of poetry contained within gleans quality through craftsmanship. In the introduction, Carla Carlton explains how making bourbon in small batches is not unlike the creation of poetry: “The success or failure . . . depends on the artistry of the maker.” The makers, in this case, are varied; ranging from Affrilachian Poets, to Cave Canem Fellows, Laureates and even freelance food writers. Under the careful editing of Leigh Anne Hornfeldt and Teneice Durrant, Small Batch goes down smoothly. The very nature of a small batch of bourbon is that it is hand-crafted, hard to emulate and repeat. It is, in essence, ephemeral, much like the relationship Nowak captures. Hornfeldt and Durrant have also selected a number of poems that are more formal in structure, and one of the stronger poems is the darkly humorous “The Housesitter’s Note” by Juliana Gray. Gray imagines a note that begins benignly with details of a wilting basil plant and ends with the house sitter’s hijacking of the home owner’s life, even up to their death: “I softly passed away in your bed. / It’s all right. It was my time to go. / And now, you’d never know that I was there / in your tidy house, your green and purring space, / except for a ghost of bourbon in the air / and, on your pillow, a single foreign strand.” Bourbon is not the engine that propels the poem forward, but it is a “ghost” that resonates. The poems in Small Batch vary in form and function, but together they are a complex brew. There are dizzying poems, devotional poems, narrative poems—and they all seem to linger with a satisfying finish. This entry was posted in Uncategorized and tagged Spring 2014 on May 1, 2014 by Kelly.